You either know the show and love the family, or you're wondering what in the world a "Honey Boo Boo" is. For those in the latter camp, here's a little background. The hit TLC show "Here Comes Honey Boo Boo" follows June Shannon and her family in their daily routine of ridiculous antics. From marriage proposals on pizza to dressing as the Kardashians for Halloween to having a pet pig named Glitzy, there's never a dull moment. Honey Boo Boo is the nickname of the youngest daughter, Alana, who rose to instant fame thanks to her loud, proud and hilarious antics on an episode of TLC's "Toddlers and Tiaras." But beneath all the deep-Southern speak (which, thankfully, includes subtitles) and strange traditions, like egg-nogging (which is a gag-inducing game of bobbing for hot dogs in egg nog), June Shannon seems to possess more financial sense than many people in the grand ol' US of A. Here's why, accompanied with some of her best tips. 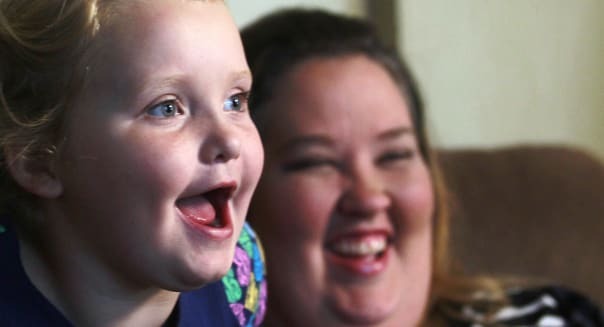 Despite the success of "Here Comes Honey Boo Boo," June Shannon and her family have largely avoided lifestyle inflation. It wasn't until this year (season three) that the family was shown house hunting to upgrade their very modest home by the railroad tracks. When the show first aired in 2012, Rosie O'Donnell actually offered to buy the family a new home. But Mama June graciously turned down the offer, stating, "We're not looking for a handout." The family doesn't only live well within their means. Mama June finds ways to save extra money with extreme couponing, and one key to her success at it is extremely simple: Be organized. She keeps all of her coupons in a binder, dividing them by product, using plastic baseball card organizers. She also says the item that people most overspend on is probably laundry detergent. She recommends using multiple coupons to buy several smaller bottles, which when put together, equal the same volume as a larger bottle, but for less money. The family seems to practice itemized budgeting, and is passing that trait on to the children. In one recent episode, when Mama June's oldest daughter, Anna, starts planning her wedding, June gives her a strict budget of $2,000. Anna has to report the cost of each and every item, and when it looks like she might go over budget, June tells her she'll have to cut a few things from the wedding. Once the budget is set, the only option is to make it work. Now that's a mama who sticks to her guns. When it comes to saving for the future, June Shannon seems to have it figured out. When the family receives money for appearing in their show, June puts most of it in equally-divided trust funds for her four daughters, as well as her granddaughter. The money will remain untouched until the girls either turn 21 or need it for their educations. So let's recap. Mama June is self-sufficient, lives within her means, coupons, budgets, teaches her children about budgeting, and saves for their futures. Many of us could benefit by taking a page out of her book -- at least financially speaking.